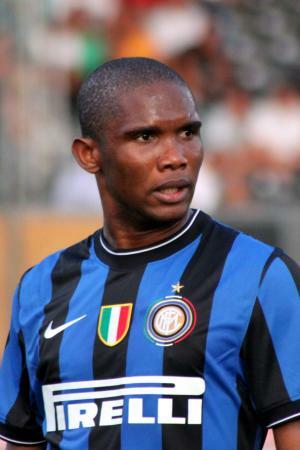 Samuel Eto’o was born on the 10th March 1981, in Douala, Cameroon, and is a professional footballer who has played for Real Madrid, Mallorca, Barcelona, Inter, Anzhi, Chelsea, Everton, Sampdoria, and currently for Antalyaspor in Turkey. Eto’o won the African Player of the Year award in 2003, 2004, 2005, and 2010, and also won a gold medal with Cameroon at the 2000 Olympic Games in Sydney. His career started in 1997. Have you ever wondered how rich Samuel Eto’o is, as of mid- 2016? According to authoritative sources, it has been estimated that Samuel’s net worth is as high as $95 million, an amount earned through his successful career as a footballer. In addition to being one of the greatest African players of all time, Eto’o has also worked as a player-manager at Antalya, and has made numerous commercials which have improved his wealth. His annual salary is $26 million, making him one of the highest-paid footballers in the world. Samuel Eto’o started playing football at the Kadji Sports Academy in Cameroon before moving to join Real Madrid’s youth ranks in 1997, but he was loaned out to Leganes, Espanyol, and Mallorca, and appeared in only three games for Real. In 2000, Eto’o signed a contract with Mallorca for a club record fee of $5 million, and won the Copa del Rey in 2003, scoring a brace of goals in the final. In 2004, Eto’o joined Barcelona in a $26 million deal, and they won the La Liga title in his first season at the club. In the 2005-06 season, Eto’o scored 26 goals in the league, claiming the Pichichi trophy for the top goalscorer, and playing a big part in Barcelona’s winning of the Champions League. The next year, Samuel ruptured the meniscus in his right knee and was forced to miss five months; in October 2007, he gained Spanish citizenship. Eto’o scored his first league hat-trick against Levante in February 2008, and finished the season with 16 goals in 18 appearances. In the 2008-09 season, Eto’o scored four goals before half-time against Valladolid, and ended the year with 30 goals in total; however, that was only enough for 2nd place behind Diego Forlan. Barcelona won the Champions League in 2009 after beating Man United 2-0 in the Final, and Messi, Eto’o, and Henry scored 100 goals combined that season. Eto’o scored 108 goals in 145 games for Barcelona. In July 2009, Barcelona made a player exchange deal with Inter Milan and $50 million in cash, bringing Zlatan Ibrahimovic in and sending Eto’o to the San Siro. In his first season with Inter, Samuel Eto’o won the Italian Cup and the Champions League after victory over Bayern Munich, when he became the only player to win the treble (domestic league, domestic cup, and European cup) in consecutive seasons. Next year, he again won the Italian Cup, and overall scored 33 goals in 67 games during two years at Inter. In August 2011, Eto’o became the world’s highest-paid player after signing a contract worth $22 million per season with the Russian side Anzhi Makhachkala. He scored a goal on his debut against Rostov, but stayed only two years at Anzhi after the eccentric billionaire owner Suleiman Kerimov decided to shrink the club’s budget and sell all of his star players. Eto’o scored 25 goals in 53 appearances for the Russians before moved to Chelsea in 2013. He signed a one-year deal with the Blues and scored nine goals in 21 games in the Premier League, including a hat-trick against Man United. However, his contract expired at the end of the season, and Eto’o joined Everton, signing a two-year contract, but stayed only six months before he moved to Sampdoria and later Antalyaspor. In June 2015, Eto’o signed a three-year contract with Antalyaspor, and scored 13 goals in first 15 matches for the club. He was even named a player-manager in December 2015, but returned to his playing role when the club appointed Jose Morais as the new head coach. Eto’o represented his country Cameroon from 1997 to 2014, scoring 56 goals in 118 matches and being a member of the winning team at the 2000 Olympic Games in Sydney. Regarding his personal life, Samuel Eto’o married his longtime sweetheart Georgette in 2007, and they have two children together: Siena and Lynn who are living with Georgette in Paris. Eto’o has two brothers: David and Etienne and they are also footballers. 4 He played for Cameroon in the 2002 FIFA World Cup of Soccer.